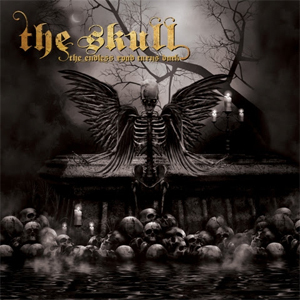 THE SKULL Stream New Album Title Track "The Endless Road Turns Dark"
THE SKULL, featuring vocalist Eric Wagner and bassist Ron Holzner, formerly of metal legends TROUBLE, has completed work on its sophomore album. Titled, The Endless Road Turns Dark, the LP was recorded in Chicago's Decade Music Studios with engineer Sanford Parker (YOB, TOMBS) and builds on the foundation laid by THE SKULL's debut album, For Those Which Are Asleep, a recording that landed at or near the top of a host of 2014 year-end best of lists. The Endless Road Turns Dark will be released on September 7 via Tee Pee Records. Today, THE SKULL releases a lyric video for the album's title track. See and hear "The Endless Road Turns Dark" now below. THE SKULL, which also features longtime CATHEDRAL drummer Brian Dixon, guitarist Lothar Keller (SACRED DAWN), and guitarist Rob Wrong (WITCH MOUNTAIN), creates classic Sabbathian doom with a psych-tinged metal vision. The respected group's impending album, The Endless Road Turns Dark, benefits greatly from the pedigree and experience of the band’s members and pushes authentic, old-school metal to heavier and more foreboding places, fueled by burly riffing, metallic groove and a crushing punch. Ethereal and wonderfully moody with a heart of heavy metal beating at its center, the record delivers definitive doom metal full of powerful builds and mesmerizing dynamic range. More than a mere throwback, The Endless Road Turns Dark is the work of a band that respects their fans, understands their own history, and still has their ears open to the current doom metal landscape. A wicked exercise in heavy metal majesty, The Endless Road Turns Dark plays like a natural extension of the musicians exemplary work during their 20-plus years with TROUBLE and cements THE SKULL as modern day doom metal royalty. "As the Sun Draws Near"
"All That Remains (Is True)"
Pre-order The Endless Road Turns Dark HERE. To celebrate the completion of the new album, THE SKULL has announced a U.S. headlining tour that launched on June 2. The 14 city jaunt will run through June 19 in Kansas City, MO. On the spring tour, THE SKULL will be joined by guest drummer Henry Vasquez of SAINT VITUS who will fill in for Dixon. Opening acts include EARTHRIDE and HYBORIAN. Find THE SKULL online at TheSkullUSA.com and follow the band on Facebook.